Last week, both health equity and health literacy were at the forefront in the Fifth Annual Health Literacy Missouri Summit and the Second Kansas Health Literacy Summit held Oct. 23 and 24 at the President’s Hotel in Kansas City, sponsored by the Health Forward Foundation and attended by approximately 160 individuals from Kansas, Missouri and states outside. 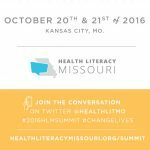 When Health Literacy Kansas had a chance this year to collaborate with Health Literacy Missouri and the Health Forward Foundation for a bi-state health literacy summit in Kansas City, we welcomed the opportunity. With the implementation of the Affordable Care Act, health insurance literacy has become a need for many newly insureds. The United States has the highest health costs with the lowest health outcomes within developed countries. 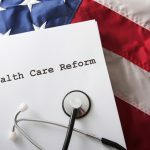 A consumer shared many barriers and frustrations he encountered while trying to navigate the health care system as he worked to manage his illness. Rather than focusing on individuals with low health literacy and poor health outcomes, we should be focusing on individuals who have low health literacy but still have good outcomes, and on those who have higher levels of literacy but poor outcomes, in an effort to better understand what factors impact these health situations. Health literacy is about communication. You should always keep the audience in mind when designing both written and oral communication products. These were merely a few of the topics shared by panelists and presenters alike. In addition, we received highlights of various health literacy projects currently underway in Kansas City. Health literacy summit: what do you want to learn?